Blue Goldstone is a dark midnight blue color with beautiful specks of copper suspended inside. This is a man made stone, Glass made from Quartz Sand. It was invented in the 17th century by a family named Miotti. Blue Goldstone was first made in Venice. 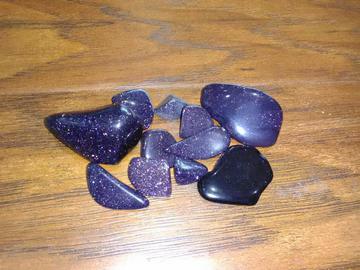 Blue Goldstone vibrates of new beginnings and balance. It is associated with the Throat Chakra, it encourages acceptance of who we are, to express authenticity and no longer deny our truth.